An excellent day can be spent on the Noosa River above Boreen Point on the Everglades in Cooloola National Park. This area is pristine, and hosts an abundance of birdlife. 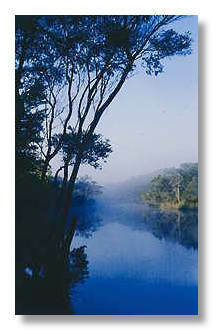 The natural bushland sweeps down to the banks of the river. This is an extremely relaxing activity, there are fantastic reflections wherever you look along this gentle waterway. The Noosa hinterland surrounding the Noosa region also has many natural resources worthy of investigation. The mountain range that divides the coastal region from the inland plains has many spectacular vantage points. Dotted along the hills are some excellent picnic and barbeque spots with quite good amenities. You will also find rambling streams that in the wet season rampage to torrents over the waterfalls above the coastal valleys. For explorers in their conventional vehicles, the hinterland towns of Maleny, Montville, Eumundi, Pomona, Kin Kin and Kenilworth all have their own unique attractions. In Noosa you do not need your own vehicles - many car rental businesses are happy to provide you with a modern vehicle - or you can take one of the bus-tours to the many coastal and hinterland attractions. Noosa has a very cosmopolitan atmosphere. The open air sidewalk cafes offer casual dining with fare from almost all corners of the earth. If you'd like to take your own picnic hamper to the beach or Noosa National Park, you will find many very well stocked delicatessens that host a huge variety of continental and asian offerings. The formal diner is also catered for through a very wide variety of Noosa restaurants. Again you can choose almost every conceivable style of cooking right here in Noosa. Our seafood is exceptional locally, as a great deal of the fare is caught in our Noosa region. You can easily spend a day in and around Noosa's boutiques and art galleries. Well known Noosa artists, Noosa potters and Noosa sculpters who display their wares locally. There are also many markets in the region held during the weekend that also offer arts and craft. The one word that best describes Noosa's dress code is casual. 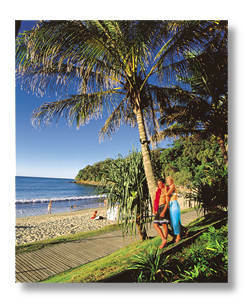 For the most part you can wander in and around Noosa dressed in shorts or slacks and t-shirts. Some restaurants do have formal dress codes for evening dining. It is best to check when reserving your table, which is highly advisable in the busy holiday season.